Welcome to the website of Paolo and Stephanie! This site contains information about the two-pianist act of Paolo Alderighi and Stephanie Trick, who concertize together in four hands on one piano. With their enthusiasm and passion for classic jazz, Paolo and Stephanie hope to make a small contribution to spreading the joy of this music. 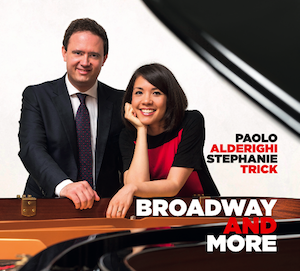 Stephanie and Paolo have just released their latest CD! They have been working on a new album, Broadway and More. It is their first CD on two pianos and includes selections by Irving Berlin, Harry Warren, Leonard Bernstein, Meredith Willson, and others. Here is a review and an interview about the CD from the blog, The Art Music Lounge.